SOLD OUT: THE STEVIE WONDER SONG PARTY: A CELEBRATION OF LIFE, LOVE & MUSIC IS SOLD OUT. 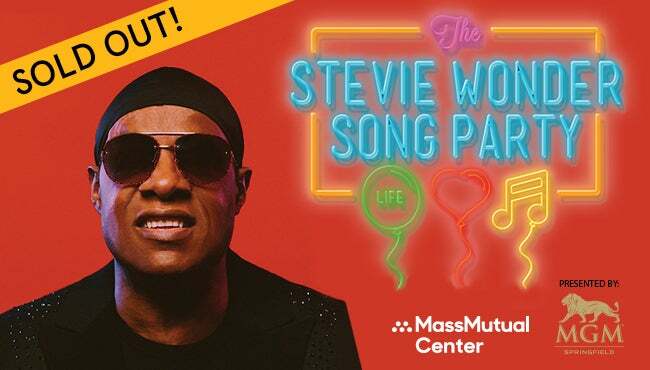 Show time is 8:00 p.m.
MGM Springfield is proud to Present legendary singer, songwriter, musician and producer Stevie Wonder who will bring his new show “The Stevie Wonder Song Party: Celebrating Life, Love & Music." Stevie Wonder is one of the most celebrated and prominent figures in popular music who, at the age of 12, was the youngest recording artist to have achieved a #1 single with “Fingertips, Part 2,” and subsequently the first to simultaneously reach #1 on Billboard's Hot 100, R&B Singles and Album Charts. While Stevie Wonder's songs are unequivocally classic and his influence timeless, equally laudable are his humanitarian efforts, philanthropic leadership, and generosity of spirit. He has received numerous accolades including awards from the President's Committee on Employment of Handicapped People, Mothers Against Drunk Driving, the Children's Diabetes Foundation and the American Association of People with Disabilities. In 1983, Stevie spearheaded the realization of “Martin Luther King Day” as a national holiday. His participation in the 1985 “We Are The World” fundraiser for hunger in Africa was a music industry milestone while his involvement to put an end to apartheid in South Africa is legendary. He is the youngest recipient of the Kennedy Center Honors, is a Commander of France's National Order of Arts and Letters and has been inducted into, among others, the Rock and Roll Hall of Fame, the Songwriters Hall of Fame, and the NAACP Hall of Fame. Upon being awarded the Library of Congress' Gershwin Prize for Popular Song, Stevie performed his commission, “Sketches Of A Life," which placed him in a very select group of eminent composers who have received library commissions, including Aaron Copeland, Leonard Bernstein and Paquito D'Rivera.